If you can figure out what kind of tree it was, or can post a photo showing what the whole leaves looked like, that could help a lot with the ID, as chrysomelid larvae tend to be very host specific. 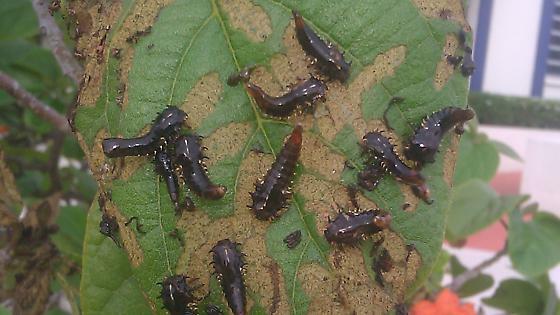 They look like Chrysomelid or Leaf Beetle larva. Some Leaf Beetle larvae are leaf skeletonizers and have this behavior of curvinge the tip of their abdomens using their excretions as a defensive mechanism.